Convict cichlids fish is very easy to keep and breed in aquariums and is therefore an ideal beginner’s fish and especially suited for those who want to keep their first cichlid. 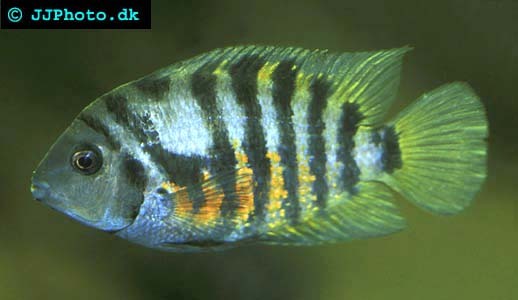 The name convict cichlid describes these beautiful fish and its black stripes on a white background very accurately. Convict cichlids are also known as zebra cichlids. Convict cichlids is a hardy species that can adept to just about any water condition which is one of the reasons behind this fish suitability as a beginner cichlid for all aquarist how can offer them an aquarium of at least 100l/ 24gallon You should however know that Convict cichlids can sometimes be white aggressive towards other fish which means that they shouldn’t be kept with other to small or timid fishes. Suitable tank mates to keep with convict cichlids are instead fish species that are large enough to stand their ground or hardy species that are fast enough to avoid the convict’s aggressions such as some barbs. Another good option is to keep a pair of convict cichlids alone in an aquarium without any other species in the aquarium. Keeping them alone will make it easier to observe their fascinating breeding behaviour including the rearing of the fry. An aquarium intended for convict cichlids should be decorated with a few flat stones and perhaps a cave or two. Plats are not necessary and most plants will be destroyed by the fish. There is however a number of hardier plants that can be kept with convict cichlids such as Amazonian swords plant and java fern. Using plants of this type can be beneficial by making the fish feel more at home and by making the aquarium more beautiful to look at. The fact is that convict cichlid will make them selves feel at home however you decide that you want to decorate as long as you avoid using harmful or toxic things in your aquarium decoration. They will accept a very wide temperature range and pH level range as long as it keep relatively stable but is best kept in 20-28C/ 68-82F and pH 6-8. Feeding convict cichlids is very easy since they accept any food you may choose to give them and can without any problem be kept and bred on foods such as flake food and pellets. 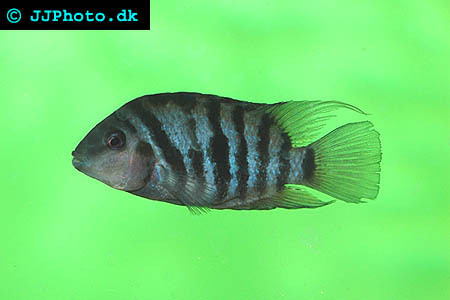 Convict cichlids are one of the easiest fish in the world to breed. They can spawn from very young age and I have seen a 50L / 15gallon in a store that contained about 50 1-2 inch long convict cichlids. The aquarium was decorated with 3 small stones at the bottom and under each of these stones you cold find a pair of convict cichlids that had dug a cave under the stone and breed in it. Whenever you visited that aquarium there would be fish breeding under each of those stones. Of course no fry managed to survive under those conditions but it reflects how easy convicts are to breed. The saying that all you have to do to breed convict cichlids is to add water is almost true. Feed your fish and they will spawn. Convicts cichlids usually lay their eggs on a flat stone and both parents guard both the eggs and the fry. They are usually where good parents and can become very aggressive towards other fish that enters their breeding territory. The fry can be feed crushed flake food and newly hatched brine shrimp. There are several colour variants of the convict cichlid such as an albino variant often sold as ivory cichlid and a pink variant. These variants can sometimes be a little harder to breed then the regular convict cichlid but you should be able to succeed as long as you keep the water clean, the fish well feed and have patience.